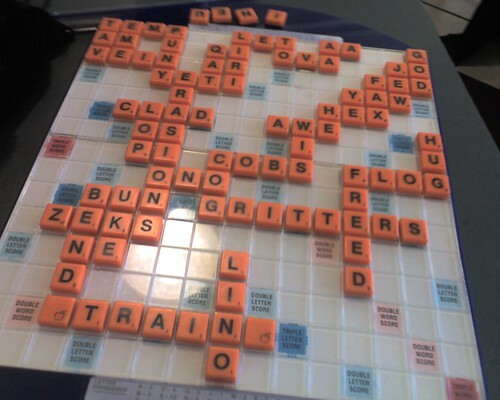 Scrabble on the Brain: Victory!! Not only did I beat Paul last night, I beat him three times!! He challenged Gritters...mostly because when I played it I had that "uh...umm...whatever, I'm behind might as well give it a shot," face on. Turned out it was good. Then I drew both blanks and bingoed with strains...Ah good times. 40 point win for Dawn. Plus I had some nice three/four letter word plays HexFax, Jew/Yaw. Good game by me. He won the first and third, I won the second and fourth. When we were two and two I got all cocky...and then got smooshed in back to back games, but then I won the last game and went home in triumph.